"Breaking Cycles of Violence: Conflict Prevention in Intrastate Crises" by Janie Leatherman, Raimo Väyrynen et al. Janie Leatherman, Raimo Väyrynen, William Demars and Patrick Gaffney. (1999). Breaking Cycles of Violence: Conflict Prevention in Intrastate Crises, West Hartford, Connecticut: Kumarian Press. 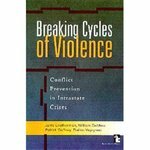 Leatherman, Janie; Väyrynen, Raimo; Demars, William; and Gaffney, Patrick, "Breaking Cycles of Violence: Conflict Prevention in Intrastate Crises" (1999). Politics Faculty Book and Media Gallery. 2.